On August 1st in Warsaw, I witnessed thousands of Varsovians freeze in Old Town and stop what they were doing for one minute. Flares were lit and smoke filled Plac Zamkowy where I was standing with friends. Polish flags waved in the slight breeze. Sirens wailed and horns blared throughout the city. I couldn’t help but become a little misty eyed as I watched everyone honor the 70th Anniversary of the Warsaw Uprising, which broke out at 5:00 p.m. on Tuesday, August 1, 1944, during World War II. The day’s code name was “W-Hour” as in Wolność, which means freedom in Polish. Every year on August 1st, Warsaw pays tribute to the Polish insurgents that fought and died in the battle against the Nazis. The insurgents had wanted to liberate the capital city from the Hitler’s occupation before the Soviet Army arrived. Unfortunately, approximately 16,000 members of the Polish resistance and 200,000 Polish civilians died as a result of the Warsaw Uprising. Plac Trzech Krzyży (Plaza of Three Churches) in ruins post WWII in Warsaw, Poland. August 1st is an important day in Polish history – and one that should never be forgotten. This year’s ceremonies hit me much harder than last year. I teared up on more than one occasion. I couldn’t help it. I think living here for over a year as an expat and understanding more of Poland’s tragic history has made me more aware of what the Polish people have suffered and endured. I think the most moving ceremony to watch was the celebrations at the Monument to the Polish Underground State and Home Army (Polskie Państwo Podziemne I Armii Krajowej) located on Wiejska Street. Here, I saw several dozen WWII survivors being honored for their bravery. 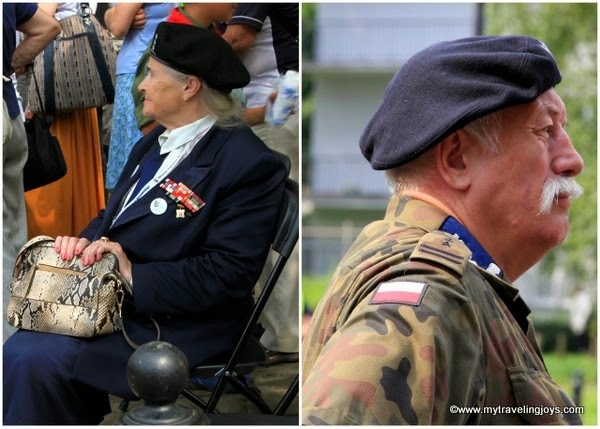 There was one elderly Polish lady, donning a beret and military uniform, who radiated with something special. I wish I knew enough Polish to speak with her and express my gratitude for her bravery. These are very courageous men and women, who are now in their 80s and 90s! That night, a Polish friend told me about her grandmother who was a nurse during the Uprising and was honored that day for her bravery. She’s in her 90s. Another emotional and surprising moment happened shortly after 5 p.m. by the Little Insurgent Monument (Podwale Street, near the Barbican). This monument commemorates the Scouts and younger participants of the Uprising. As I was taking photos here, we heard loud motorcycles roaring along the street and stop nearby. 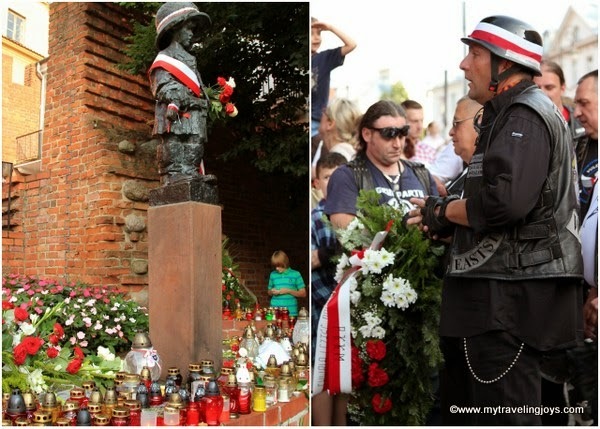 Suddenly, about 20 Polish bikers approached the monument carrying red and white flowers, decorated wreaths and candles. I was not expecting this! Lastly, I was impressed by the number of young boys and girls and teenagers participating in the Uprising ceremonies. The youth are members of the coeducational Polish Scouting and Guiding Association (Związek Harcerstwa Polskiego or ZHP) which is recognized by the International Boys and Girls Scouts Organizations. During WWII and the Uprising, the Scouts cooperated with the Polish underground and Army and helped carry out sabotage activities and armed resistance and later fought in the Uprising battles while the Girl Scouts generally worked as nurses and liaisons. The youngest Scouts assisted the wartime efforts by distributing leaflets and painting the kotwica symbol (the initials P and W together meant Polska Walcząca (Fighting Poland). The Polish kotwica symbol in candles, representing the initials P and W for the Powstanie Warszawskie (Warsaw Uprising). I bet there were hundreds, if not thousands, of Scouts in Warsaw on August 1st! If you ever find yourself in Warsaw on August 1st, please remember to stop what you’re doing and honor the “W-Hour.” I’m sure you’ll feel like I did – amazed, impressed, thankful and even a bit saddened. Polish nuns light candles at the Warsaw Monument to Insurgents (Pomnik Powstania Warszawkiego 1944) on ulica Dluga. Colorful memorial candles at the Warsaw Monument to Insurgents (Pomnik Powstania Warszawkiego 1944). Participants of the Warsaw Uprising used sewers like this one to escape the Nazis and get around the city. If anyone knows the significance behind the different color of Polish Scout uniforms, please let me know. "The Insurgents" - a wonderful photo exhibit of the remaining Warsaw Uprising survivors. Thank you for this fine post and your photographs and thoughts. I forwarded it to a friend for her husband. He's a 90 year old Polish Resistance veteran living in America. Hi Libbie! Thank you for your very kind comments! I hope your friend and her family enjoys this post too. A very moving day indeed! Kotwica is from Polska Walcząca (Fighting Poland) but i think it is not bad to ascribe it to Powstanie Warszawskie cause it match and the meanings are similar. I personally hate Warsaw Uprising, it makes me cry. I respect suffering of insurgents and civil people but i think the uprising was an example of our polish stupidity or romanticism, as someone would like to call it. We believe(d) in justice, in honour, we often (were)are guided by it but there is no honour in politics, in war. We were and are fools. We lost a lot, our place among rich, cultural, classy societies/nations. For ever. I am refering now to events 1939-XXI cent. Pity but it's our fate. Only celebrations are left. These are some great shots Joy. Thanks for sharing! Great photographs and its good to see young people honoring the men and women who fought in the Polish Resistance during World War 2. I've never visited Warsaw only Krakow now I've got Warsaw on my list. I will remember and go to the memorial and leave some flowers.